You are met at Maun Airport by a Wildlife Africa representative and transferred by air to your choice of Xugana Island Lodge OR Camp Okavango. 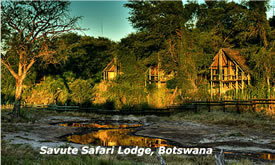 Spend two nights on a full board basis and including all safari activities and local brand beverages. After your morning game activity followed by breakfast you are transferred by air to Savuti Safari Lodge where you will be accommodated for the next two nights on a full board basis and including all safari activities and local brand beverages. Savute Safari Lodge peers out from Camelthorn trees on the shore of the Savuti Channel. The lounge, library and cocktail bar are situated in the exquisite thatch and timber main building, where an upstairs viewing deck allows Savuti’s enchanting sunsets to mesmerize guests. A large fireplace downstairs is equally inviting on winter nights, while the delicious aroma of dinner and the prospect of candlelit, silver-service dining beckons the elegant dining room. 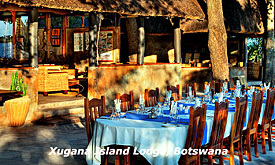 Exclusive accommodation provides twelve tastefully furnished twin bedded Safari Suites for a maximum of 24 guests. The unique design of the suites with their spacious interior and large glass sliding doors sets the lodge apart from typical safari accommodation. Private viewing decks and en suite facilities combine luxury and comfort with a classic wilderness experience. 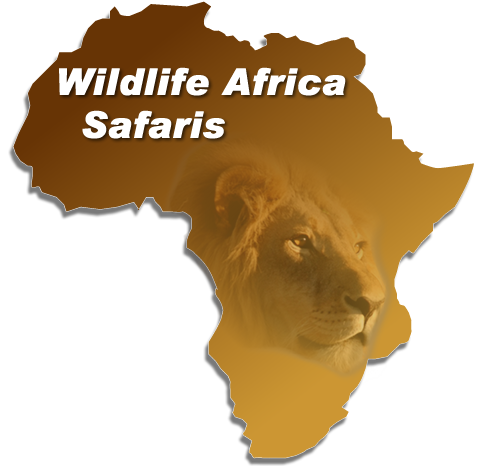 The World acclaimed game viewing of Savuti is an experience not to be missed. The Summer rains brig a feast for lion, hyena and cheetah as thousands of migrating zebra and wildebeest assemble in a chaotic pattern on the marsh. Cape Buffalo herds arrive and migrant birds swell Savuti’s resident 300 species, thrilling birdwatchers with their peculiar antics. A journey to Savute Safari Lodge and Africa’s fabled Stolen River will enrich your soul. After the morning activity and breakfast you will be transfer by charter flight to Kasane Airport, where you are met by our representative and transferred by boat to Chobe Savanna Lodge where you will be accommodated for the next two nights on a full board basis and including all safari activities and local brand beverages. as well as concentrations of other wildlife. This area is an untouched water wilderness sanctuary, ideal for quiet discovery or relaxation, where game and bird life flourish undisturbed under the protection of the Chobe National Park. 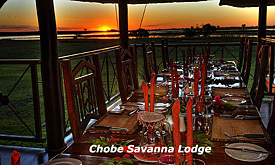 The focal point of the lodge is a thatched open sided main building which commands a 270 degree view over the Chobe River. Located in the main building is the lounge, dining room and bar areas furnished with African inspired furniture in dark teak woods. The lodge accommodates just 24 guests in stylish thatched chalets, all with private decks, a combined bedroom / lounge area and en suite bathrooms. All rooms are furnished in subtle earth tones and dark woods in a contemporary African theme, are air conditioned, and have complimentary mini bars. Facilities include a swimming pool and an open boma area, where local villagers treat guests to traditional dancing performances. The Lodge offers guests the choice of just taking ?time out? or joining in on one of the many activities offered at the lodge. All activities are conducted by resident professional guides. Guests have a choice of walking safaris, or boat excursions ideal for close up encounters with wildlife along the river?s edge. Depending on the time of year, guests are also offered the opportunity to take canoe excursions along the river. 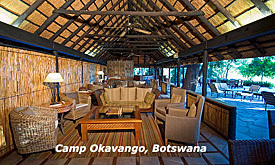 For those interested in learning more about the local communities that inhabit the remote areas of the Caprivi Strip, the lodge arranges private visits to villages, where guests can observe traditional life styles of the people. Fishing trips accompanied by proficient guides together with the necessary fishing tackle can be arranged. After your morning safari activity followed by breakfast, you are transferred by boat to Kasane and by road/boat to the Royal Livingston Hotel on the Zambian side of the Falls. 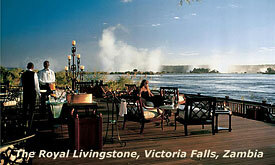 Spend two nights at the Royal Livingston on a bed & breakfast basis and also including unlimited access to the Falls. Transfer to Livingston Airport, where our services end.